Just Which Jane Austen Character *Am* I? Of course, I am not all that well versed in Jane Austen, but well, sometimes I like to do these little memes anyway. Thanks to Kasia, for posting the link on her blog. 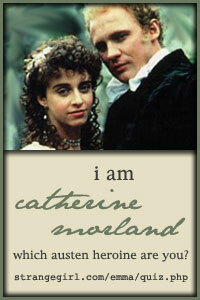 You are Catherine Morland of Northanger Abbey! You love a good Gothic romance – so much, in fact, that you’ll fool yourself into thinking you’re living one! You are imaginative and naive, which is at once endearing and perplexing. Perhaps your heart is TOO pure…but it is adventurous. After all, you love a trip to Bath or a stay at an ancient Abbey. Previous Racking Up Time in Purgatory, I’m Sure….